Known as the “Valley of the Sun” Phoenix is the capital of Arizona with a population of 1.5 million according to the 2010 census. Phoenix is the largest state capital city in the United States and the sixth most populous city in the nation. Phoenix was settled in 1867 as an agricultural community and later incorporated as a city in 1881. Until World War II, when high tech industries began to develop, Phoenix was known for its contribution to the “Five C’s” (cotton, cattle, citrus, climate and copper). In 1889 the city offices were moved from Prescott, Arizona to the new City Hall in Phoenix at Washington and Central Avenue. The development of the Santa Fe Railroad allowed for a connection between Phoenix, Flagstaff and other northern communities, therefore contributing to the economic rise. A portion of the original Capitol building is now maintained as the Arizona Capitol Museum. Today, Phoenix is home to many important businesses that support all of the surrounding metro-cities. Downtown Phoenix is comprised of historical residential districts, such as the popular Encanto Palmcroft District or Willo District, medical facilities and Sky Harbor International Airport. The airport is the primary hub for the southwest region, including Mexican and Hawaiian departures. Sky Harbor International Airport is the largest and busiest airport and largest commercial airport in the southwest. St. Joseph’s Hospital has been providing high-quality, affordable healthcare for Phoenicians since the early 1800s. St. Joseph’s Hospital is a nationally recognized center for healthcare, medical education and research. Their services include maternal fetal medicine, cancer center, emergency/trauma, lung transplants, and Barrow Neurological Institute, which has been a leader in neuroscience for more than fifty years. Downtown Phoenix has plenty to offer from fine dining to local boutique shopping to the best in live entertainment. Home to the Arizona Diamondbacks, Chase Field was built in 1998 as a multipurpose facility and home to the first Major League Baseball team in the state. This state-of-the-art ballpark is approximately 1,300,000 square feet, divided into six levels. Two unique features of Chase Field include the indoor swimming pool and the retractable roof that allows for game-day goers to enjoy the beautiful weather in Arizona. Perhaps you prefer basketball over baseball? Well, Phoenix has you covered with two teams, the Phoenix Suns and the Phoenix Mercury who both play downtown at US Airways Center. If you like to tour museums or take in a show, there is plenty to do in downtown Phoenix. Here you can enjoy the Hall of Flame and the National Firefighting Hall of Heroes, which is open daily. The Arizona Science Center is another great place to check out in downtown Phoenix. There is an IMAX® and Planetarium facility, hands-on activities for the whole family plus a regular schedule of unique and interesting events. If you are more the arts and culture type or even the musical enthusiast, you will find that Phoenix has some of the best in these categories for entertainment. The Celebrity Theatre, the Orpheum Theater, and Comerica Theater are great venues to see some of the most popular artists and bands throughout the year. Phoenix Symphony Hall has been providing entertainment for valley residents since 1947, and each year preform nearly 200 concerts and presentations. Also located downtown is the Phoenix Convention Center which hosts some great events throughout the year including special events, such as the 2015 NFL Experience and the Amazing Arizona Comic Con. If you are looking for designer swag, you will want to check out the Biltmore Fashion Park. Here you will find some of Phoenix’s premier dining and upscale shops like M.A.C. Cosmetics, Ralph Lauren, Pottery Barn, Saks Fifth Avenue, Stringray Sushi and The Capital Grill, to name a few. If you prefer shopping local, you may want to check out “First Fridays” in downtown Phoenix. You can enjoy the spirit and culture of the inner-city and tour art galleries, local businesses, and street vendors. Phoenix, Arizona has the perfect weather, almost year-around for outdoor entertainment and recreation. A long-time favorite for locals and visitors has to be spring training baseball and Phoenix is home to the Cactus League, which manages fifteen teams that train in the Phoenix-metro area. Hiking and golf are another popular choice for the active outdoor lifestyle. At Encanto Park, you can do both and more, like stroll along the fish-filled lagoons or take a ride on one of the three railroads. Encanto Golf Course, an 18-hole championship course, happens to be the third oldest golf course in Arizona, built in 1935 by William F. Bell. This is a public golf course, click here for tee times and rate. If you prefer a little more physical challenge like hiking, you will find one of the most of the best hiking trails in Phoenix, Arizona. Camelback Mountain provides a scenic backdrop to the Phoenix horizon and has several trail heads with a variety of difficulty. As with anytime you are hitting the trails, make sure you follow the trail instructions and put safety first! Although it may not be as strenuous as hiking the rugged terrain of Arizona, the Desert Botanical Gardens is a great choice for recreation and education. For more than seventy years, this facility has been educating visitors how to protect and preserve the desert. Desert Botanical Gardens is 140 acres and includes fifty-five acres under cultivation and 50,000+ plants on display. The Phoenix Zoo, Arizona Center for Nature Conservation is a great place to visit, especially during the holidays. “Zoo Lights” runs from Thanksgiving weekend through New Year’s with more than 700 shining lights on display and a synchronized light show with 15,000 twinkling lights. Zoo Lights is definitely a holiday must for the whole family! 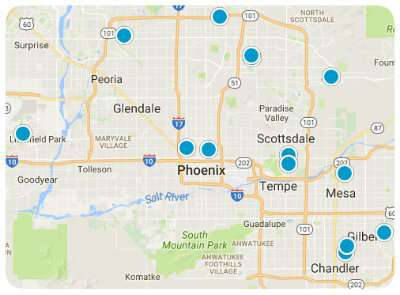 In the city of Phoenix, there are 325 public schools in thirty districts, plus more than 200 charter and private schools to choose from. Two of the distinguished private schools in Phoenix include Brophy College Preparatory and Xavier College Preparatory Roman Catholic High School. Brophy, an all-boy school is the only Jesuit High School is Arizona and has been teaching young men since 1928. Its counterpart, Xavier is the all-girl school which was founded in 1943 by the Sisters of Charity of the Blessed Virgin Mary. Phoenix has plenty to offer those looking for a higher education, including choices like Arizona State University (ASU) with campuses in Phoenix, Tempe and Glendale, Arizona. There are a variety of community colleges in Phoenix such as Paradise Valley CC, Gateway Community College and Phoenix Community College. Additional college universities in Phoenix are Grand Canyon University, Devry University Phoenix Campus and the University of Phoenix.